Hi, and welcome to my page! My name is Michelle and I'm a relocated Tennessee girl living in the Michigan thumb. As far as chickens, my bantam menagerie consists of Cochins, Silkies, & Salmon Faverolle in several varieties, as well as spangled Orloff. 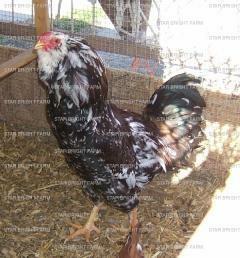 My standard breeds of choice are Rosecomb Rhode Island Red, buff Chantecler, spangled Orloff, & blue/splash Orpington. Pics of all of my birds can be seen on my website: starbrightfarm.net ...or simply click on the website link located below my avatar.